No doubt many of you will have seen the film version of Stephen King’s IT at cinemas recently but have you watched the TV mini-series from 1990? Well it’s (pun intended) available on Blu-ray and is certainly worth a look. 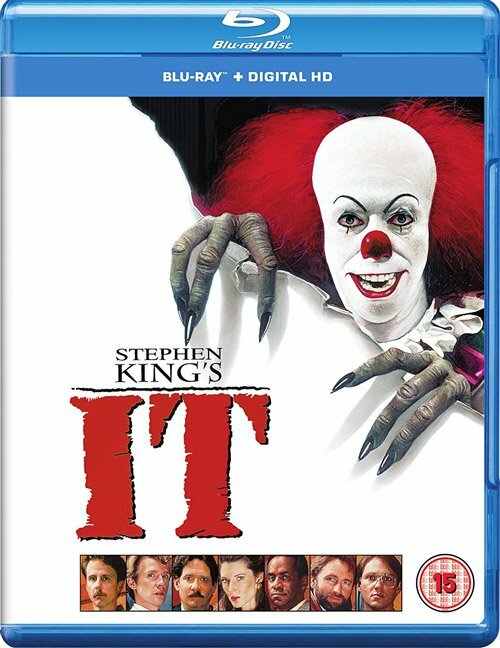 If you wish to know more then read on as it’s time for my IT Blu-ray Review. Following several murders of young children in the small town of Derry in Maine seven children band together to fight the evil responsible. That evil takes on the form of a clown named Pennywise. The horror of which will remain with them into the adult lives where they will called upon to honour a promise made back in their childhood days. IT was made as a television min-series back in 1990 it still looks rather good in terms of style and location. The problem with mini-series tends to be a slump midway through owing mainly to padding to make the required time for television. Re-watching IT again I can happily say that it doesn’t suffer from this issue and flows nicely. At a little over three hours this simply flew by as I found myself being caught up in the story. The story focuses on a group of seven friends brought together and aptly name by themselves as the losers club or lucky seven. I would have to say the child actors put in the better performances reminiscent of those in Stand by Me. The older versions possibly have the harder job of trying to carry over the traits of their younger versions. In the end the acting can be slight cringe worthy but I can look past it as the story is extremely compelling. The late Jonathan Brandis as the child version of Bill puts in a particularly good performance and is the key character that pulls the rest of the group together. The adult version is played by actor Richard Thomas whom is best known for playing John-Boy Walton from the TV series The Waltons. Another stand performance comes from Seth Green as the Young Richie Tozier. He is excellent as the budding comedy actor and outshines his older counterpart. Green is known for his roles in Buffy the Vampire Slayer and guest starred in an X-Files episode as well as appearing in several film roles. If you are into playing computer games then you may well be familiar with him as he voiced Joker in the Mass Effect series. He also provides the voice of Chris in the animated TV series Family Guy. Who is the best Pennywise? There’s an ongoing debate online about who is the best Pennywise, is it Tim Curry in the TV mini-series or Bill Skarsgård from the film. I’m opting for Curry but then I did watch his version first many years ago and it’s kind of stuck in my mind. I’d forgotten just how much I had enjoyed IT the television min-series. With the film version still in cinemas I would recommend taking a look at this television version that is available now on Blu-ray. I thoroughly enjoyed it with the child versions of the character really stealing the show. If you can’t wait for chapter two of the film version then this complete offering will more than satisfy your clown cravings! Credit to Warner Bros they usually put out excellent picture quality versions on Blu-ray and happily IT continues in that vein. IT has a nice and clean, sharp image along with vibrant colours. Oh and there are no speckles anywhere to be found which is excellent news. On to the extras and Warner Bros have only included an Audio Commentary which is a shame, it would have been nice to see a couple of new interviews with cast and crew. Stephen King’s IT is a must see and the TV mini-series delivers a chilling tale!